Marjorie Dean Andruk was born August 11, 1922 in Norforlk, VA. She received her BFA from the Maryland Institute College of Art in 1942. Marge was the first woman press photographer at the Baltimore Sun from 1943-1946. After moving to St. Petersburg, FL she became the Art Organizer for the Catholic Diocese of St. Petersburg. After many years, she returned to the University of South Carolina and received her MFA in 1976. After receiving her MFA, Marge went on to exhibit nationally in solo and group shows. Some of these exhibitions included solo and group exhibitions at the Arts Center. 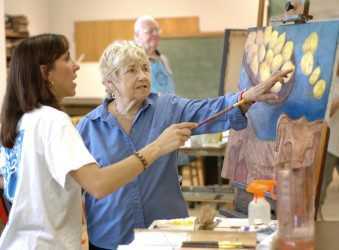 She was a well-respected and loved painting instructor at the Arts Center for nearly 20 years, with a loyal following of students. Marge passed away in 2010 at the age of 87.